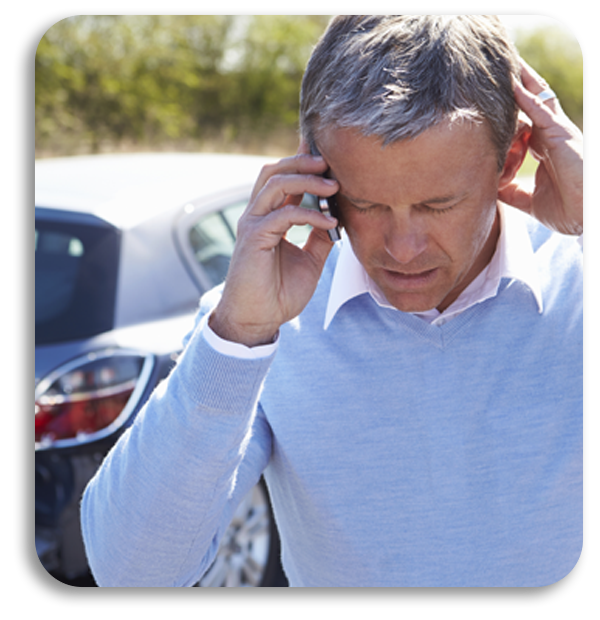 He's frustrated that all agents are busy when he calls to file his claim, but remembers he doesn't have to wait. Self-service is often a preferred starting point for digital consumers. 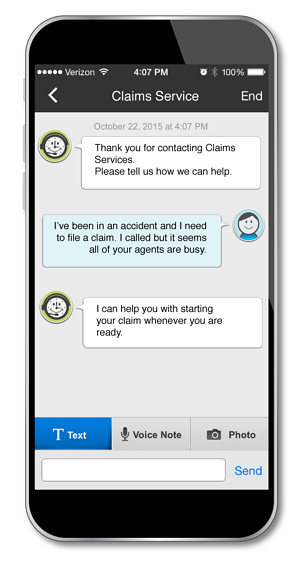 My:Time™ makes self-service better, and also provides a seamless transition to live service when customers need assistance. Dave feels in control. Instead of waiting, he's making progress filing his claim. My:Time can drop into your existing web and mobile apps to enhance and extend self-service and live assistance capabilities. My:Time can also become your mobile app if you're just getting started or planning to make a major upgrade. Either way, My:Time creates a common experience across the web, mobile web, and smartphone apps. 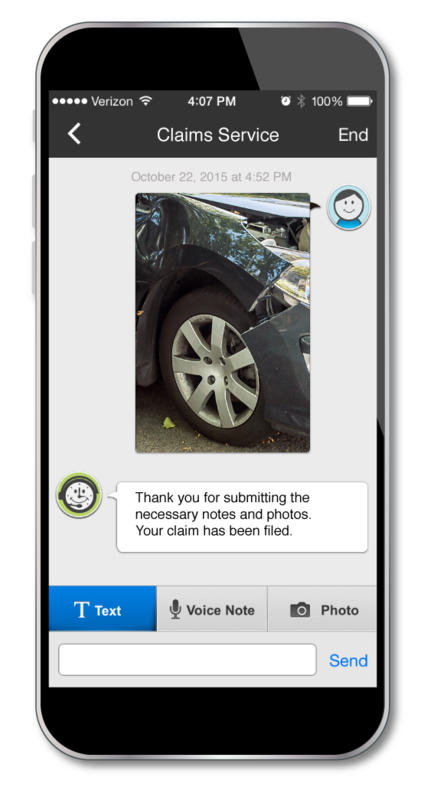 Dave can use text, voice notes, and pictures to describe his claim. My:Time provides a multi-modal communication channel for both self-service and live agent interactions. Use text to complete forms or chat with live agents. Voice notes are easy to record and add to the stream when texting isn't convenient. They also capture tone and emotion that text alone can't convey. When words aren't enough, just drop photos right into the conversation stream. Dave completes his claim form, adds a voice note and a few photos, then taps to submit his claim. 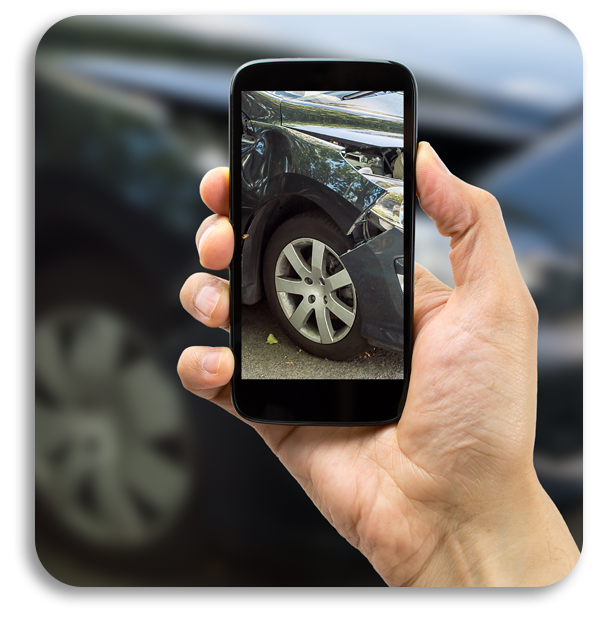 Dave gets a notification from an agent asking him to submit one more photo that captures a clearer view of some of the damage. Dave complies, and soon gets a notification that his claim has been filed and accepted. Mission accomplished. Next time, he'll skip the phone and go straight to My:Time. Creates one place where any problem can be solved, even if live assistance is needed or simply desired. Customers are more likely to begin with self-service knowing they can get any type of assistance they need, if they need it. My:Time becomes the trusted starting point for customer interactions.